Israel's Ambassador to the United States spoke in Milwaukee Tuesday. The event, held at the Milwaukee Rotary Club, drew protestors concerned about the uptick in violence in the Middle East after the U.S. moved its embassy from Tel Aviv to Jerusalem. On May 14, the 70th anniversary of Israel's founding as a country, the U.S. officially recognized Jerusalem as the capital of Israel. The move brought about increased violence between Israeli soldiers and Palestinians along the Gaza border, ending in more than 60 Palestinian deaths in two days, as the Washington Post reports. Israeli Ambassador Ron Dermer told the Rotarians that moving the embassy will eventually advance the cause of peace by weakening claims that Jews don't have traditional rights to Jerusalem. "By saying the Jews have a right to an embassy in their sovereign state, you begin to puncture this lie," Dermer said. 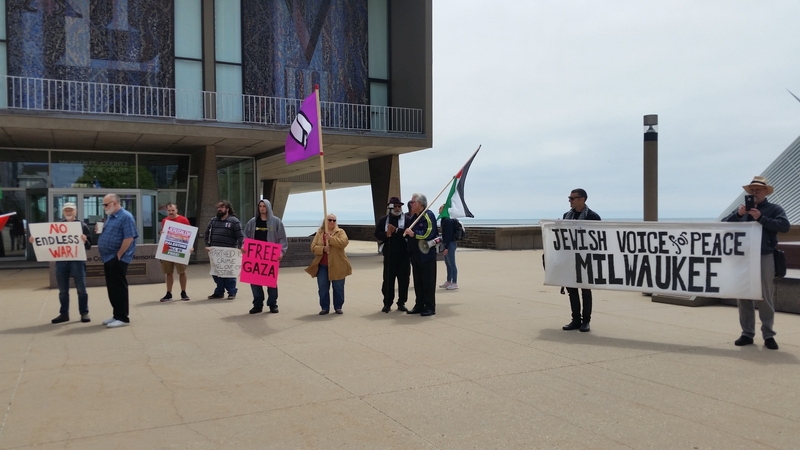 About 25 people from various peace groups, including Jewish Voice For Peace, protested outside the Milwaukee County War Memorial Center, where Dermer spoke. Jewish Voice spokesperson Ravil Ashirov called Dermer "just one of many criminals responsible for the suffering by Palestinians that has been going on for 70 years," Ashirov said, referring to how long Israel has been a country. Ashirov added that the violence worries a lot of Jews in the U.S.
"The liberal Jewish romance with Israel is incrementally coming to an end. And, this recent massacre in Gaza is just another blow that it's taking, until it will eventually fall off completely," Ashirov maintained. While not commenting specifically on the recent violence involving the Palestinians, Dermer told the Rotarians: "When you judge Israel, judge it as a country that is a beleaguered democracy, faced with threats that no other democracy on earth faces."